Richard was the fifth son of Sir Francis Knollys and Catherine, the daughter of William Carey. He grew up on his father's estate at Greys' Court and at his town-house in Reading. In adulthood, he resided at Stanford-in-the-Vale in Berkshire and was MP for Wallingford in 1584 and possibly for Northampton in 1588. 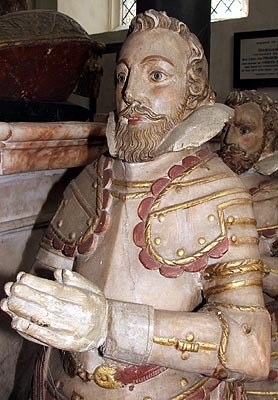 He died at Rotherfield Greys on 21st August 1590, having married Joan, the daughter of John Heigham of Gifford's Hall at Wickhambrook in Suffolk and sister of John Heigham of Stanford. Her second husband was Francis Winchcombe of Bucklebury House, also in Berkshire. She was buried at Rotherfield Greys on 10th October 1631. Sir Robert Knollys (d. 1659), her son by her first husband, was knighted on 10th January 1613 and acquired the Rotherfield Greys estate from his uncle, William, the Earl of Banbury, on 4th March 1631. The lands were only finally alienated from the family in 1686.